During my nineteen year career as a community organizer, we spent a lot of time talking about religious congregations, labor unions, neighborhood organizations and schools as “mediating institutions” (page 699). These are groups that “mediate” between individuals with little power and government and other larger entities. They perform this function by bringing together these individuals to organize for their needs and beliefs. Edmund Burke called them “little platoons”; Alexis de Tocqueville described them as “associations”; and Richard John Neuhaus coined the term “mediating structures” (read more here). In our organizing, we would help build “organizations of organizations” composed of these mediating institutions to advocate for their goals and to help develop leadership. It’s disappointing to me that there doesn’t seem to be much talk about this important role of schools these days and, as one result, you get people talking about a need to punish students who walk out to protest gun violence. We’re missing public discussion of the historical role of schools as engines for social change. 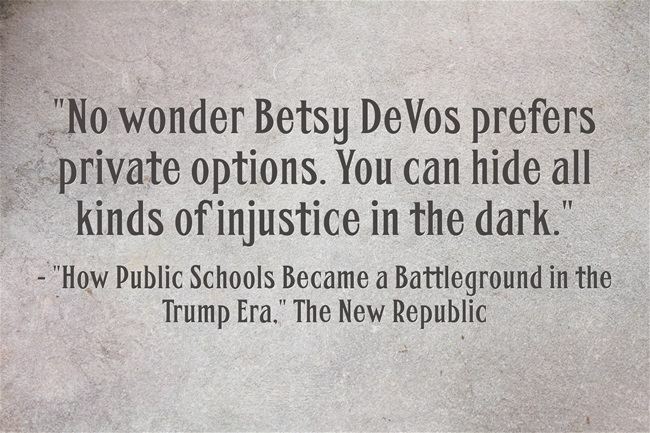 However, Alexander Russo recently shared a good article in The New Republic that begins to touch on these ideas: How Public Schools Became a Battleground in the Trump Era. It doesn’t really fit, but I’m adding this to The Best Articles Providing An “Overall” Perspective On Education Policy. I’m also adding it to The Best Posts & Articles On Building Influence & Creating Change.